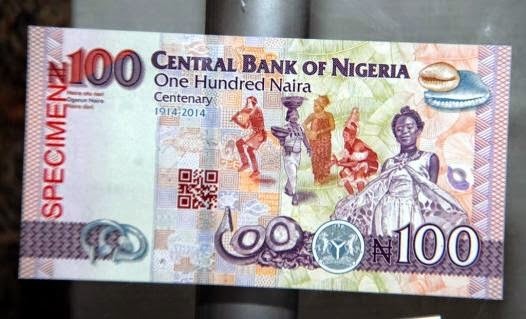 The Central Bank of Nigeria, CBN, has unveiled the first digital N100 paper note, to commemorate Nigeria’s Centenary. The new note was unveiled at the Federal Executive Council, FEC, meeting, in a presentation by the CBN Governor, Godwin Emefiele. The new note which has features for the visually impaired will be officially issued into circulation on Friday December 19, 2014. The unveiling is part of the series of activities lined up for the eventual injection of the new note into circulation. On Wednesday, November 19, the new note will be sent to banknote equipment manufacturers and other machine suppliers to enable them adapt to machines and authentication devices. On November 26, there will be a publication of the new N100 bank note to be sent by the CBN to commercial banks, chamber of commerce, Nigeria Police force, cash in transit companies etc. 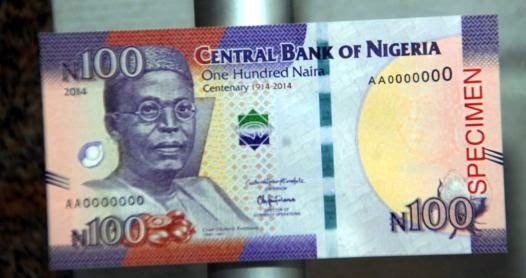 On Wednesday December 3, leaflets on the N100 bank note will be sent to 1,000 Point Of Sales (POS) in the country, including a reminder about adapting machines and devices. While on Wednesday, December 17, a film showing how to check the new hundred naira bank note will go live on the CBN YouTube channel. Explaining the features of the new banknote, Mr. Emefiele said the new note was designed with enhanced security to offer robust resistance against counterfeiting. “We have produced a banknote which is the first of its kind, but most importantly it has been designed and produced with most advanced technologies in the world,” he said. He noted that in the process of producing the new note, the following was taken into consideration: “Durability, to make it tolerant in tropics and in doing that we introduced a two sided interglow barriers, both at the front and the back. We also made the note attractive for public acceptance. Emphasis was also placed on our rich cultural heritage. The note has a transformational character”. Explaining the features he said on the front side of the note is a public authentication features, window micro-optics, showing the national flag and numeral100 indicating the value of the denomination and the attainment of the centenary period. The second is a spark feature of a rolling manilla bar which was the instrument used during the slave trade era. A portrait of Chief Obafemi Awolowo is retained both in the ink, that is the interglow level, as a portrait and also in a paper as a shadow image. “We made provision on the front for the visually impaired individuals in our midst by having a raised and embossed line,” he said. At the back side, the CBN introduced a feature called Quick Response Code, QRC. It is a feature that highlights and sources all the information about the centenary. “This makes the note the first digital banknote in the world,” he said. The QRC is an application found on the smart phone or Ipad. Once the barcode on the back of the note is scanned it shows the President’s face and then comes up with all information on Nigeria’s history. President Goodluck Jonathan thanked the CBN for unveiling the note. The Coordinating Minister of Economy and minister of finance, Ngozi Okonjo Iweala, said introducing the note was a smart move and the feature of the QRC is educative. But she went on to ask how much it will cost to print the notes. The President said this will be discussed when the memo is presented.